ROCKFORD — When the IceHogs needed to kick-start a comeback Sunday against Iowa, they could have turned to any number of players. Rockford, Ill.- Sunday's Iowa Stars and Rockford IceHogs game was almost like looking in a mirror. Down by one, the IceHogs hit three goals in the first five minutes of the third period at the Rockford MetroCentre to go up by two. The Stars then cut the lead in half, but couldn't close the deal. Rockford, Ill.- The Chicago Wolves and Rockford IceHogs have returned to their early-season theme, this time with a twist. Games between the two teams are usually close and tonight the Hogs came out on top 3-2 in a shootout at the Rockford MetroCentre. Chicago, Ill.-Chicago Blackhawks General Manager Dale Tallon announced on Wednesday that the National Hockey League club has returned winger Troy Brouwer and defenseman Niklas Hjalmarsson on loan to the Rockford IceHogs of the American Hockey League. MILWAUKEE, Wis. — Goalie Wade Flaherty earned his 300th win Monday night as the Rockford Icehogs defeated the Milwaukee Admirals 4-1. Flaherty had 17 saves as the IceHogs took sole possession of second place in the Western Division. Chicago, Ill.- General Manager Dale Tallon announced today that the Blackhawks have recalled forward Troy Brouwer from Rockford of the AHL. ROCKFORD -With a renewed sense of urgency, the Rockford IceHogs finally found their offensive prowess in the second period against Milwaukee on Saturday. The IceHogs, who had lost their last two games, bounced back against the Admirals with a 3-1 win in front of a crowd of 4,725 at the MetroCentre. Rockford, Ill.- The Rockford IceHogs take back sole possession of second place with a big 3-1 win over the Milwaukee Admirals at the Rockford MetroCentre. Chicago, Ill.- Chicago Blackhawks General manager Dale Tallon announced Sunday that goaltender Corey Crawford has been assigned to the Rockford IceHogs in the AHL. ROCKFORD — Rockford IceHogs coaches Mike Haviland and Ted Dent have decided this is a fine time to start issuing fines. Tired of their team’s stick penalties, which include hooking, tripping and high-sticking, players now will have to pay an unannounced amount for future infractions. Tom Petty first sang about it six years before Bobby Hughes was born in 1987, but the injured Alb­any River Rats rookie centerman can relate. The waiting is the hardest part. Still more than seven months shy of his 21st birthday, Hughes has been sidelined since Jan. 5 with a neck/back ailment that has ended his season and put his career in doubt. The Chicago chapter of the Professional Hockey Writers Association has nominated Blackhawks goaltender Patrick Lalime as it nominee for the Bill Masterton Memorial Trophy. ROCKFORD — Knock, knock. Who’s there? Bryan Bickell. Let me in!Sorry, no punch line, although a bit of humor is present. Bickell, actually, didn’t knock on the MetroCentre door to gain entrance Sunday afternoon. He pounded. And pounded. Original Black/White Telecast from 1971 to air on March 18 at 10:30 PM CSN Blackhawks announcer Dan Kelly, along with Hull & Mikita, to Host Telecast. Chicago, IL (March 12, 2008) – Comcast SportsNet, the television home for the most games and most comprehensive coverage of the Chicago Blackhawks, will deliver a special Blackhawks classic game from December 11, 1971, as Hall of Famers Bobby Hull, Stan Mikita and Tony Esposito led the Blackhawks to victory over the Toronto Maple Leafs. 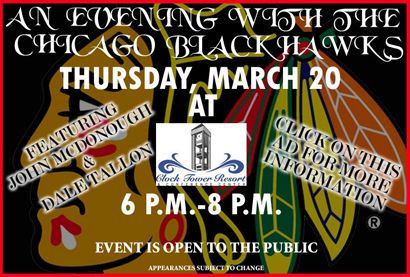 This special Blackhawk Legends game telecast will air on Comcast SportsNet on Tuesday, March 18 at 10:30 PM. 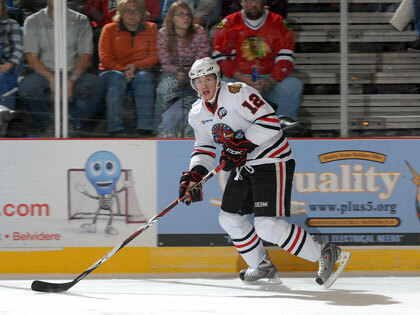 Rockford, Ill.-Rockford IceHogs General Manager of Hockey Operations Al MacIsaac announced on Tuesday that the American Hockey League club has signed defenseman Tyson Marsh to a 25-game PTO. 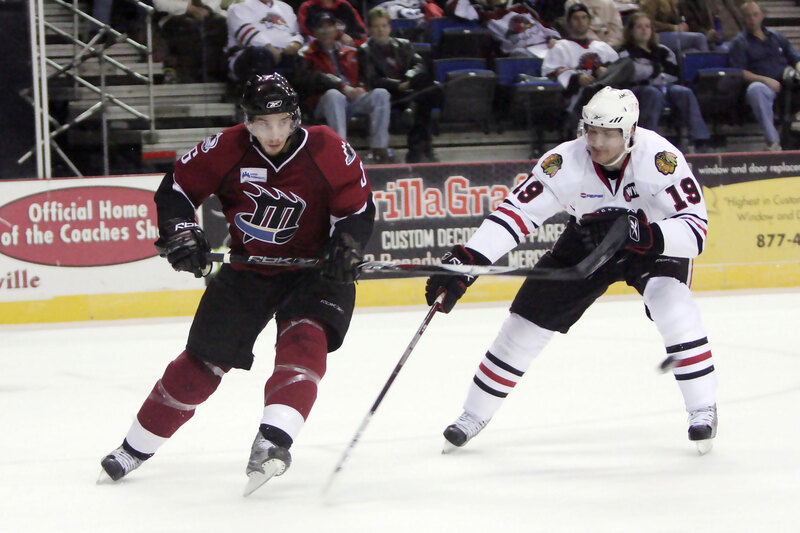 Marsh was loaned to the IceHogs from the ECHL’s Columbia Inferno. Rockford, Ill.-The playoff push is here, and IceHogs goalie Wade Flaherty has been there and done that. 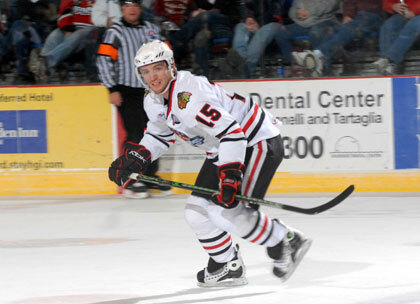 Flaherty came up big during Week 23 to help Rockford keep pace in the wild West Divison. 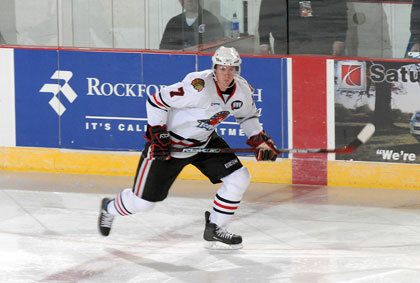 Flaherty turned away 103 of 111 shots faced over three games to help lead Rockford to a 2-1-0-0 record. The Hogs now hit the road for a pair of contests in Houston against the red-hot Aeros. ROCKFORD — Mike Haviland emerged from the Rockford IceHogs’ locker room after Sunday’s game with a puck in his hand — to commemorate his 300th professional coaching victory. He certainly knew whom he had to thank for it. Milwaukee, Wisc.- Third period leads have been pretty automatic for the Rockford IceHogs this season. The Hogs took an early third period lead against the Milwaukee Admirals but were outworked the rest of the way and fell 3-2 at the Bradley Center on Saturday. 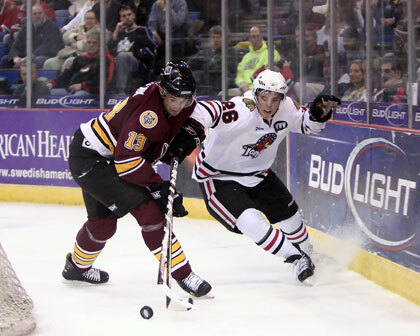 ROCKFORD — Role reversal was the key for the Rockford IceHogs. Assists leader Martin St. Pierre did the scoring and scoring leader Troy Brouwer got the assists Wednesday night on two first-period goals that put the IceHogs on track for a 3-2 victory over the Peoria Rivermen at the MetroCentre. The game winner came on Jake Dowell’s second-period shot that gave Rockford a three-goal advantage. Rockford, Ill.- Wade Flaherty set a season high in saves as the Rockford IceHogs exacted a little bit of revenge on the Peoria Rivermen on Wednesday. 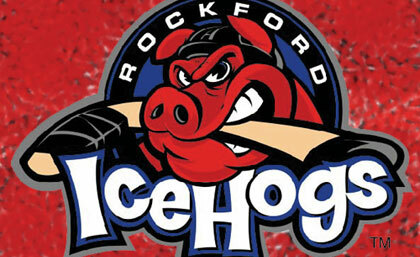 The Rockford IceHogs came back from a 4-3 loss at the Rockford MetroCentre on Sunday to beat Peoria 3-2. ROCKFORD — Sometimes you go to a bank for a loan. The Rockford IceHogs instead went to Norfolk, Va. It wasn’t money they sought, but nevertheless an investment in their future. As in acquiring the services of a player to help pay dividends immediately in their playoff push. Rockford, Ill.- The IceHogs brought home the big win on Saturday, but couldn't follow it up with two in a row on Sunday as the Hogs fell to the Peoria Rivermen 4-3 at the MetroCentre. Chicago, Ill.- Chicago Blackhawks General Manager Dale Tallon announced today that the Blackhawks have recalled forwards Bryan Bickell and Jake Dowell from Rockford of the AHL. Bickell becomes the 17th different Rockford player to get a recall to the Blackhawks this season. Rockford, Ill.- The Rockford IceHogs jumped to a early 3-0 lead in the first period and carried it into a 5-1 win over the AHL's top team on Saturday in front of 6, 051 at the Rockford MetroCentre. The Hogs now look to build on the win on Sunday against the Peoria Rivermen.